This book is an autobiography by Dr. James Jerger, but this is also a book about the history of audiology. In the larger scheme of things, I guess it didn’t matter that Dr. Jerger, as a young recruit in 1946 went AWOL for several days, but it definitely adds colour to our field. It probably is irrelevant that he managed to skip basic training, and found himself, by accident of course, aiming a loaded rifle at his commanding officer during a practice session. I guess it’s nice to be human. In many cases the people that are now in our field came through unusual past times and circumstances before entering our field. Some were women’s dress cutters, and other’s like Dr. Jerger took a more direct path. After an undergraduate at Northwest University in Chicago- interrupted by 2 years of military service, Dr. Jerger wanted to do graduate work in Iowa. However, he was able to get an assistantship with someone named Raymond Carhart so he was able to stay at Northwestern. This was to perform hearing aid evaluations under Dr. Carhart’s guidance. The book continues, touching on encounters with many of the famous names in our field. Dr. Jerger found himself on the ground floor of many of the technologies and techniques we use every day in our field, and with his research and clinical talents, was able to help push our field forward. This paragraph says it all. This is a book with anecdotes, incidents, accidental crossings, and descriptions of the birth of technologies, all written in a very gentle manner. I read the entire book in one sitting and was left wanting to read more. 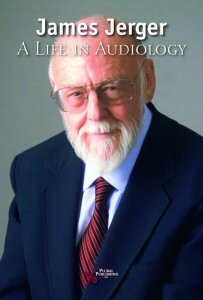 Dr. Jerger, other than being Dr. Jerger, is also an excellent writer and has nicely conveyed his love of audiology. I have no intention of lending this book to anyone since I will probably want to reread it in a year or so.